The PERRIN Performance oil cooler will reduce engine oil temperatures and extend engine life. Some engines do not have an adequate factory oil cooler and therefore runs hotter oil temperatures then other performance vehicles. The PERRIN oil cooler tames oil temperatures keeping them at a consistent 85-90C (185f-194f) where the engine makes the most power. Keep your HP consistent with a PERRIN oil cooler. Each PERRIN oil cooler maximizes heat dissipation without pressure build-up. Oil-ways are interspaced with airway corrugations providing optimize heat transfer. While the oil passages use “turbulators” to break down boundary layer effects in the oil flow. The PERRIN Performance filter adapter features an integrated 85C (185F) thermostat. This means oil will not start flowing through the oil cooler until oil temps reach an optimum temperature of 85C. 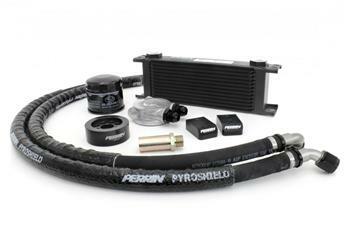 PERRIN’s oil cooler kit uses lightweight Aeroquip brand -10 hose that is rated for 250psi and 215F. Each hose consists of anodized -10 push-lock type aluminum hose ends. These fittings are designed to fit without the need for clamps, but we take the extra step and add a clamp ensuring they will never come apart. Unlike other kits that make you assemble your hoses, PERRIN preassembles them for you!